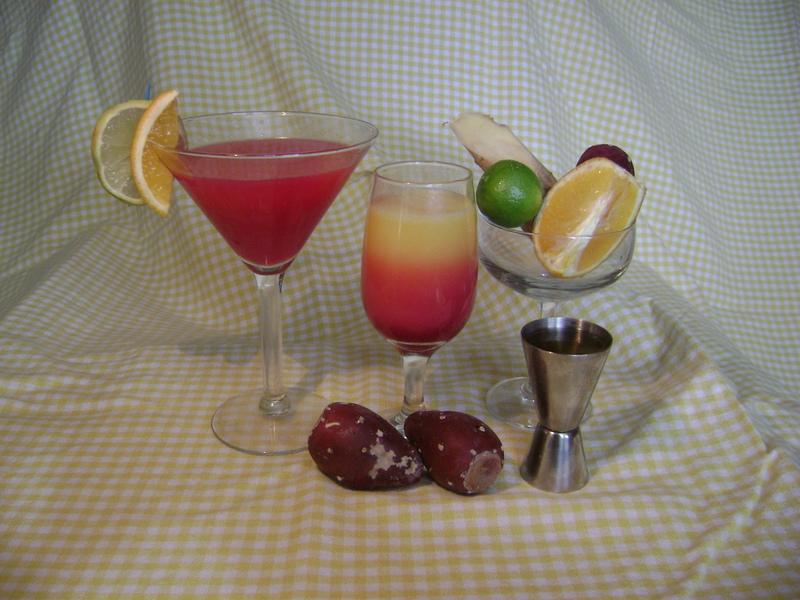 Prickly pear syrup combined with fresh juices makes delicious holiday cocktails. Prickly pear syrup, either something you’ve made yourself or one of the wonderful commercial products, adds a special Southwestern touch to your holiday cocktails. And cocktails are big this year! My husband Ford and I attended a cocktail class at Tucson Botanical Gardens last summer and we’ve had great fun concocting our special blends. The class was taught by the bartender from Scott & Co., a popular downtown Tucson drinking spot. We learned that the most important key to a delicious cocktail is fresh juices. We’re lucky that we have orange, tangelo and lime trees in our yard, but citrus is widely available in the supermarket or farmer’s markets. You also need something to give the juices a little edge, such as bitters or ginger syrup. To make ginger syrup, I grate a 5-inch piece of fresh ginger and simmer for 30 minutes in a cup of water. Strain out ginger and reduce liquid to a half cup. Add a half cup sugar or agave syrup and cook a few minutes to dissolve sugar. Now the fun starts. Tasting as you go, blend some fresh juices, add some bottled cranberry juice at this time of year, add a little prickly pear syrup and a dollop of ginger syrup. Tequila, vodka or run all work well for the alcohol. I go light on alcohol since these drinks are so good people tend to slurp them down. Your cocktail may look something like the one in the martini glass in the photo. There are lots of places to get prickly pear syrup if you haven’t laid in a supply of your own. Cheri’s Desert Harvest syrup is available throughout the Southwest. Jeau Allen sells prickly pear syrup on-line and at farmer’s markets throughout the Tucson Valley. Awesome blog post. I really appreciate an author who takes the time. I hope to read more of your work in the future.